Gyeryongsan, or Rooster-Dragon Mountain, so named because its ridge line resembles a dragon wearing the crown of a rooster, a 848 meter (2,782 ft) mountain in Chungcheongnam-do, in the western part of South Korea, is one of Korea's three holiest mountains, and is believed to have the most most qi (spiritual energy) of all the mountains in Korea. Because of this, Gyeryongsan is a popular site for Shamanic ceremonies and rituals, and contains sixty Shamanic shrines. The mountain is also popular with hikers and Buddhists visiting the local temples. Parts of the mountain located in a Korean military reserve have been closed to the public since the 1970s. In the Silla Dynasty, Gyeryongsan was designated as the Great West Mountain out of the Five Great Mountains. 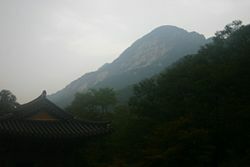 During the Joseon Dynasty, it was the Central Peak of the Three Great Peaks. Over the years the mountain has been known by other names, including Kyeram-san, Ong-san, and Joongak-san. Its striking appearance caught the attention of geomancers, and numerous times in Korean history, as recently as the Joseon period, recommendations were made that the capital be located near Gyeryongsan. At the beginning of both the Goryeo and Joseon dynasties, the founding kings considered building their capital city near Gyeryongsan, but finally decided against it. Muhakdaesa, the monk who advised Taejo of Joseon to establish the capital in Seoul, predicted that Seoul would be the capital of the dynasty for 500 years and the next dynasty would establish its palace on Gyeryongsan. Many Buddhist and Shaman religious communities worshiped on Gyeryongsan during the Joseon dynasty, hoping to be ready for the new dynasty when it came. Part of the Baekdudaegan Mountain Range, Gyeryongsan is somewhat isolated from the rest of the mountains in the range, making it a monadnock mountain, which was formed by an upheaval of the continental plates. The mountain lies west of the city of Daejeon and south of the city of Gongju, the ancient capital of Baekje, one of Korea's former three kingdoms. Also located near the mountain is the city of Gyeryong. 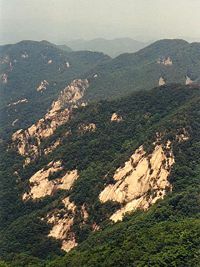 Portions of the mountain are included in a South Korean military reserve. Other portions are part of Gyeryongsan National Park, Korea's second oldest National Park, created in 1968. Noted temples located on the mountain include Donghaksa (Eastern Learning Temple), Gapsa (Armour Temple), Sinwonsa (Spirit Garden Temple) and Shinheung-am (Spirit-rising Hermitage). The Gyeryongsan Natural History Museum (계룡산자연박물관), located near the entrance to Gyeryongsan National Park, opened in 2004, has a full range of exhibits including dinosaurs, fossils, ocean life, the universe the human body, and also exhibits about the natural features of the Gyeryongsan area. Donghaksa Temple, one of the most impressive temple complexes in Korea, was originally called 'Sangwonsa Temple', named for Sangwon, the master teacher of Heoeu, the monk who supervised its construction. One of the first part of the complex that Heoeu built was a pagoda to preserve Sangwon's relics. The temple was later renamed Donghaksa. It is said that the name of Donghaksa originated from the rock near the temple that resembles a crane. The temple complex includes Daeung-jeon, Sukmojeon, Sameungak, Budo, and a graceful three-storied stone pagoda. Munsuam, Gilsangam, and Mitaam are three auxiliary temples attached to Donghaksa. Main hall at Donghaksa temple. Donghaksa has been the site of important memorial services for Kings Chungjeong and Gongmin of Goryeo. 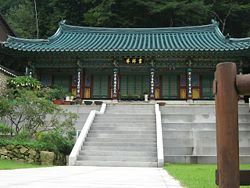 Rituals were also held at Donghaksa to honor Jeong Mongju (pen name Poeun), famous scholar of the late Goryeo period, and the Sameungak shrine was built to enshrine his spirit, along with two other scholars, Lee saek (pen name Mogeun), and Giljae(pen name Yaeun). Another shrine, Donggyesa, enshrines the patriot Park Jesang of Silla. The main Buddha hall, Daeungjeon, is surrounded by mountains, creating a cozy atmosphere, and offers a good view of the Sambul Peak of Gyeryongsan. The Sukmojeon shrine, was built in 1455, to enshrine the spirits of six martyred ministries who died along with King Danjong of Joseon, part of the bloodshed surrounding King Sejo of Joseon in his quest for the throne. In the shrine, King Sejo enshrined memorial tablets for Danjong, his nephew, whom he had displaced from the throne, and two of Sejo's younger brothers, Prince Anpyeong and Prince Geumseong, who had also been rivals for the throne. Another distinction of Donghaksa is that it houses a "Donghak Buddhist College," a college for training Buddhist nuns of the Jogye Order. The school was started in 1816, in the sixteenth year of King Sunjo of Joseon at Yujeomsa on Kumgangsan. In 1864, year one of Gojong's reign, the school moved to Donghaksa. A walk along the streams from Donghaksa to Gwaeum peak by way of Euseon fall leads you througn the beauty of the 4 kim long Donghaksa valley. Parts of the forest are so dense that sunlight cannot penetrate the treetops. The old saying, "Donghaksa for Spring, Gapsa for autumn," attests to the beauty of the temple. About a three hour hike from Donghaksa is Gapsa Temple, a temple of the Hwaeom sect, located on the northwestern edge of Gyeryongsan with dense old pinewoods, zelkova trees, red persimmons and maples that make the area around Gapsa Temple very beautiful in the fall season. Gapsa Valley reaches from Gapsa to the Geumjandi valley with its graceful maples is considered one of the eight most beautiful landscapes of Gyeryongsan National Park. Gapsa Temple was first built more than a thousand years ago. According to the legend, the old Buddhist priest Adohwasang put a foundation stone on Baeseokdae, recommending a temple be built at the site, in first year of King Guisin of Baekje (420). Later the great Buddhist priest Uisangdaesa remodeled Gapsa, for seeking truth of Hwaeom. During the Japanese invasion in the late sixteenth century more than 800 monk soldiers stayed in this temple. After being destroyed by fire during the war, the temple was reconstructed. The present temple has about ten buildings including Daeungjeon (main Buddha hall) and Daejeokjeon, and precious cultural assets like Budo, Cheoldanggan, Jiju, and Wolinseokbo-panbon (21 books, 46 pages). Gapsabudo Gapsabudo (Treasure No. 257) stands in front of the antique-looking Daejeokjeon with the Gapsa valley running along the front. A stonework fromthe early Goryeo period, Gapsabudo is an octagonal carved tower 2.05 m with an ornate two-tiered base which is shaped like a blooming lotus flower. Lions, and figures of the four Devas are carved into the structure, and its jade lid is shaped like a tiled roof, making it a particularly unusual work. Cheoldanggan This Danggan (a banner pole made of stone, steel or wood which is used for fluttering pennants during the performance of rituals) was made by the great Buddhist Euisangdaesa in the nineteenth year of King Munmu in the Unified Silla (680). Originally there were 28 banners but four of them were destroyed in the thirty-fifth year of King Gojong (1899), leaving 24 now remaining. It was designated as Treasure No. 256. It stands 15 m tall and is made of iron. 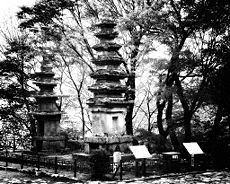 On the way from Donghaksa to Gapsa, two pagodas stand abreast; Treasure No. 1284 and 1285, also called Onuitap (brother and sister). Nammaetap, a pair of pagodas built in memory of a legendary monk and his adopted sister, a seven-story pagoda for the brother and a five-story pagoda for the sister. They sit one hour from Donghaksa on foot, roughly 1.7km. The site is also called Cheongnyangsaji-ssangtap since Cheongnyangsa Temple was formerly located there. According to legend, a man from the royal family (some versions say it was a famous monk) retreated to a cave in the twenty-third year of Queen Seondeok of Silla, and was living there in meditation. One day he rescued a tiger who was suffering from a bone caught in its throat. The tiger brought a lady to express its gratitude. The man discovered that the woman had been recently married in Sangju, Gyeongsang-do. On the first night of her wedding, she had gone out to get some fresh air, and had no memory of what happened next nor how she found herself to be with the tiger. Since it was a very cold winter season, they had no choice but to stay together in the cave. Later, she asked him to marry her but the man concretely rejected her, knowing she was already married. Instead, he promised to live with her as brother and sister. After living together many years in the cave, they died at the same time on the same day, and the two pagodas, a seven-story pagoda for the brother, and a five-story pagoda for the sister were built in their memory. Sinwonsa, an old temple rebuilt by the Buddhist priest Bodeokhwasang in the eleventh year of King Uija (651) is located at the southern outskirt of Gyeryongsan, near Yeoncheonbong (Endless Heaven Peak)—roughly 50 ri (20km) from the south of Gongju. It has been remodeled several times and is famous for its lotus flower patterned tile. 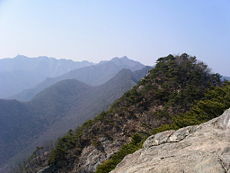 Because of its status as one of the country's highest and holiest mountains, Gyeryongsan was chosen as the site for the Jungakdan (Central Peak Altar) on the Sinwonsa Temple grounds when it was built by the royal family in 1394, in the third year of King Taejo, and the royal family held special prayer rituals in it every spring and autumn. The current Jungakdan was rebuilt during the reign of Gojong. Sinwonsa also includes a Daeungjeon, Dokseonggak, and Yeongsanjeon, in addition to other cultural assets including a five-story pagoda (Local Tangible Cultural Asset No. 31) and an octagonal Budo. Ceremonies honoring the Sansin (Mountain Spirits), considered to be sons of Dangun; ancestral spirits of the Korean people, are held each year at Sinwonsa, with a series of ceremonies and rites by by Buddhist, neo-Confucianist and Northern and Southern Shamanist practitioners. Similar rituals were held throughout the Joseon period but were stopped during the Japanese occupation, and revived only in the late 1990s. Gyeryongsan is the home of many shrines and hermitages used by Korean Shamans for ceremonies and kut. One of these is the Golden Dragon Hermitage, located about a mile above Sinwonsa Temple. On the trail leading from Golden Dragon Hermitage toward Yeoncheon Peak is another, the Bogwanam, or Treasure-Brightness Hermitage. Near Yeoncheon peak is another, Deungeunam. These hermitages contain paintings of Korean's mountain spirits. The Gowangam (Ancient King Hermitage) does not contain a mountain spirit painting, but a Buddhist deokseong painting. It is said that dozens of other Shamanic shrines were removed from the mountain in the 1970s when the military base was relocated to Gyeryongsan. Waterfalls and Hot Springs. Climbing up along the valley from Donghaksa, one is led to Eunseonpokpo (Eunsun Falls). The falls are 50 m tall and falls directly down from the cliff. This is the coolest place on the mountain to find refreshment on a hot summer day. The other major waterfalls on Gyeryongsan are Yongmunpokpo (Dragon Gate Falls), Suyongchupokpo (Male Dragon Pool Falls) and Amyongchupokpo (Female Dragon Pool Falls). Near Donghaksa is the Donghaksa Hot Springs. Valleys. There are seven major valleys on Gyeryongsan: Donghaksa Valley, Cheonjang Valley, Gongwol Valley, Gapsa Valley, Suyongju (Male Dragon Pool) Valley, Odaeseong Valley, and Amyongju (Female Dragon Pool) Valley. Flora and Fauna Gyeryongsan has a wealth of plants and animals, including 25 species of mammals, 52 species of birds, and 1,184 species of insects. Gyeryongsan Natural History Museum – (in Korean). This page was last modified on 21 July 2017, at 15:26.